Celebrity Horoscope - Priyanka Chopra - The Desi Girl. 2. Position of Ascendant Lord and 10th house lord. 4. 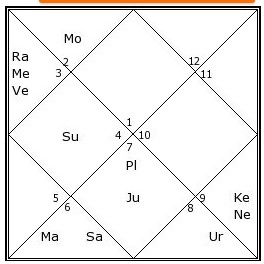 Rahu-Mercury-Venus in 3rd house. 5. Current MD of Jupiter. So, let’s begin. This horoscope will again show that MD Planet rules our life and career, no matter how other planets relevant to career are indicating. 1. Ascendant – As we can see that she has an Aries Ascendant. Aries are born Go-Getters in life. Action Oriented and People with Power of Initiation, and it is for the simple reason that Aries is the 1st sign of Zodiacs. Everything initiates from there. All planets started their journey from Aries. So, it is sign of lots of action and energy. Aries people are physically very active and as Ascendant rules the Physique and Persona of Native, we can see that in her personality. She always lived in Army environment as her Dad was in Army, so we can understand that she was always very active physically. Now, Aries Ascendants are normally in the fields of Army, Sports or Medicines. How come she became a Beauty Queen and then a Celeb? Let’s find it out going forward. 2. Position of Ascendant Lord and 10th house Lord – For anyone’s career, Ascendant Lord and 10th house Lord gives the biggest indications, as position of Ascendant Lord shows the Life Path and position of 10th house Lord is Career’s direction. So Prima-Facie, it is confusing. Ascendant Lord - Mars and 10th house Lord – Saturn, both are in 6th house in Virgo. It shows life path and Career in Serving Others, much like jobs. Prima-Facie, without looking in details, anyone would say this is chart of an Advocate. No way. Look little deeper. Mars is in Chitra Nakshatra. Chitra literally means Picture. So, this is a nakshatra of people involved in Creative Pursuits. Saturn is in Hasta Nakshatra, which is nakshatra of Hard Working and Self Made people. So, we got some idea here but things will be clearer going forward. What else we can say with Saturn and Mars in 6th house? Saturn is 10th house lord, i.e. it rules house of her Father. It is going into 6th house of Service. It is conjunct Mars, which is a natural significator of Soldier and Army. So, Father serving in Army. 3. 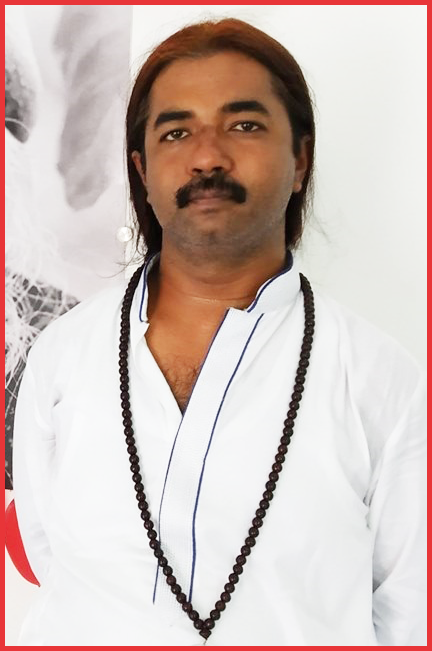 Ascendant Nakshatra – Ascendant Nakshatra is always the Life Pattern. So, Ascendant Lord decided that she should be in service of others but what type of Service will be defined by Ascendant Nakshatra. Her Ascendant Nakshatra is Bharani. It is ruled by Venus. Venus is planet of Beauty, Creativity and karaka of any Creative Career. Where is Venus placed? It is in 3rd house of Skills, Interests, Hobbies, Self-Efforts and Communications. So, her life pattern got decided in these field of work and serve people with her Creative Pursuits. Now, the biggest factor. a. 3rd house – Having 3 planets in 3rd house means that life focus will be Skills, Interests, Hobbies, Communication and Self Efforts. Such person can’t be successful in jobs, telling from my own experience, lol. Person has to nurtures his skills and interests to gain in life. b.	Mercury – Mercury rules 3rd house & 6th house and sits in its own sign Gemini in 3rd house. This means this Mercury is very strong. It means she became very good with her skills and interests through her self-efforts. It also links her 6th house with 3rd house. It means her Services would be in Creative field. c.	Venus – Venus rules 2nd house & 7th house and sits in 3rd house in friendly sign of Gemini. 2nd house is Wealth and 7th house is Masses and Other People. So, her Wealth is coming from Creative Skills and by connecting to masses. Venus in Gemini actually seals it as someone working in Media because Venus is karaka of Creativity, TV, Cinema etc and Gemini is sign of Communications. So, her fate was very much sealed in 3rd house. d.	Rahu – And Rahu came in 3rd house as the reason behind her incarnation. As we know that Rahu changes itself as the lord of sign it is sitting in and it also changes itself as the planets it is sitting with. Rahu also then explodes the qualities of those planets it is sitting with. So in her case, Rahu changed itself as Venus & Mercury and then exploded the qualities of Venus and Mercury, which are all about Creativity, Interests, Hobbies, Skills and Communications etc. Rahu in 3rd house exploded her courage and will to experiment with her Creativity and take up different Roles from Fashion to Aitbar to What’s Your Rashi to Barfi to Mary Kom. She had the audacity to experiment and go out of the league. Actually, Rahu itself represents Creativity, so it really exploded her creativity. Rahu also represents Fame and the best thing here is that her 1st fame as Beauty Queen Came in 2000 when she was under Rahu-Mercury Dasha. People can say that her Rahu Dasha started in 1992, so why it took 8 years for Rahu to give her fame? Well, she was 10 years old in 1992 and the field she was trying for fame has a legal age bar as 18. As soon as she was 18 in 2000 and tried her luck in beauty contests, she got success and fame. May be if she had tried to be a Child Artiste from 1992, then she might have got fame then also. Then her 1st fame came in Foreign Lands. 4th house is homeland. 3rd house is 12th from 4th house, so it becomes the house of loss of homeland, which means Foreign Land. When Rahu is in 3rd house then it is a great chance to go to Foreign Land under Rahu MD as Rahu itself represents Foreign Things. Finally, her Rahu MD ended in 2010, leaving her on a completely different stage then where she was when it all began. 5. Current MD of Jupiter – She is currently going through Jupiter MD. Jupiter sits in 7th house of Other People and Masses in her chart. It also rules 9th house through Sagittarius and 12th house through Pisces sign. 9th house relates to Far Distant Places & People of Different Ethnicity and 12th house relates to Foreign Lands. Rahu and Jupiter’s mutual aspect continues to impact her Jupiter MD. It shows that since start of her Jupiter MD in 2010, she got more opportunity of working in Foreign Projects and with people of different ethnicity. Actually, as long as she desires to work, she will have fame among masses as Jupiter is ever expanding her 7th house of Masses and Rahu & Jupiter’s mutual aspect ensures that her fame increases during Jupiter MD too. No comments on Personal Life. Hope this helps and covers maximum points on her Career, Fame and Celebrity Status.